Two thousand years have passed since Sauron was defeated by the last alliance of men and elves. Now he has risen again and seeks to recover his one ring, the source of all power. 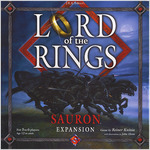 In this expansion one player takes the part of Sauron, the Dark Lord, and plays against the fellowship. Sauron watches over the players' every move and uses the Black Rider figure and special Sauron and Nazgul cards to strike. New resources come to the Hobbits' support. Also included: Dark events, an independent set of event tiles that increases the challenges of the original board game and its expansions. Some event tiles may now be rejected - you decide.